The Rocket TFC Concept provides meaningful insights into how the future, production-spec TFC version of the massive Rocket III could look like. With its origins traced back to the year 2014 with the launch of the TFC Bobber and the TFC Scrambler, the Triumph Factory Customs (TFC) line-up for 2019 includes the Thruxton TFC and the all-new Rocket TFC Concept. While the Thruxton TFC is ready for production and available for ordering in the UK, the Rocket TFC remains a Concept as of now and the production-spec model will be launched by Triumph on 1st May 2019. The Triumph Rocket III was first launched in 2004 and it still holds the record for being powered by the world's biggest production engine - a massive 2,294cc three-cylinder motor which generates 146bhp and 221Nm of torque. However, Triumph has said that the new TFC version of the behemoth will feature an all-new Triple motor (which will have an even larger displacement), coupled with a new suspension, chassis and brake setup. In contrast, the Thruxton TFC remains similar to the original Thruxton R with only some component changes. Based on the images of the Concept, one can spot an Arrow exhaust system with carbon-fibre covers and a carbon-fibre windscreen as well. The chassis and suspension changes mentioned above can be verified based on the fact that the Rocket TFC Concept makes use of a monoshock and a single-sided swingarm. 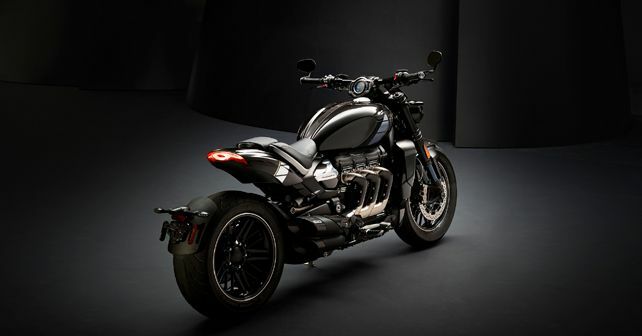 While the Triumph Rocket III continues to be all about massive proportions, we can't wait for the official debut of its production-spec TFC version. As per the TFC ritual, the Rocket TFC will also see a limited production run of just 750 units.